That’s right! The current dj at Thursday 9 to midnight – Dancehall Vibes with The Hawaiian Lion – is on vacation this week and next week. That means that for a limited time, The So Very Show will be simulcasting on KTUH! Our guest this week on The So Very Show is Sunshine Jones of Dubtribe Soundsystem (Treehouse Muzique, King Street Sounds). Sunshine is a dynamic artist whose love of house music is infectious. His album, Seven Tracks in Seven Days, is out now on King Street Sounds, along with alternate mixes. Check out “Distant Vision“, “Anywhere You Are“, and “I Believe” for a taste. 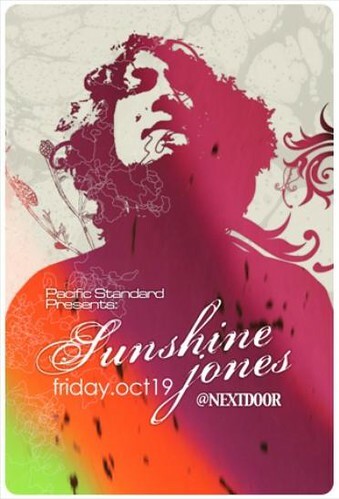 Sunshine will be performing live at Next Door on Friday, October 19th. Get to know Sunshine on The So Very Show on Thursday, and get ready to dance together on Friday! We’ve been stoked on Sunshine’s brand of house goodness since before Bubbles went on his buying spree of the Imperial Dub back catalog. We’ve been waiting to do this show for three years! We could go on and on, but let’s just cut to the chase. 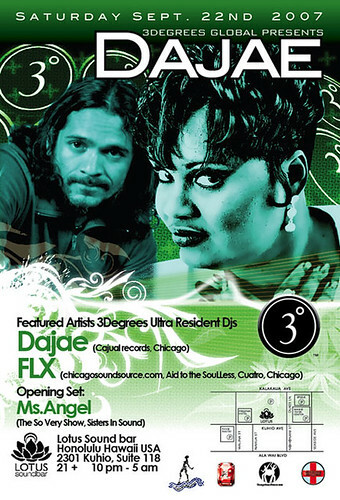 If you love deep house like we love deep house, this is a show you do not want to miss! The show starts at 8pm Hawaii time (that’s -10 GMT) and as always, will be broadcast live at 90hz.org. Do you have a question for Sunshine? Then leave us a comment, or send your question via email. We’ll also have the chat up during the show, so pop in and say hello. In addition to touring, recording, remixing and more, Sunshine also has a wonderful radio show on 90hz.org. In fact, it’s thanks to him that we found our new internet-radio home. Listen to Sunday Soul every Sunday afternoon for even more Sunshine goodness. UPDATE: This week only, The So Very Show will broadcast live on 90hz.org from 7pm to 10pm Hawaii Standard Time/10pm-1am PST. On October 4th, we resume broadcasting at 8pm HST/11pm PST. Changes keep coming over at The So Very Show, we hope you can keep up! This week, we’re hitting the road and doing our very first broadcast from San Francisco, California. Your driver on this trip is the very skilled, So Very host, Haboh! Since moving to San Francisco this summer, Haboh has remained involved in the So Very show, and supported us in our move to 90hz.org. Last week he provided us with a peek at what he’s been picking up in the record shops while in SF, when he did a two hour live set on the show here in Honolulu. This week we’ll dive deeper into the collection, and find out more about how SF life is treating him with some special guests and more choice wax. For SF natives, this weekend is a big one. The “Love Festival” (formerly Love Parade SF – or whatever they’re calling it now) happens this weekend and in true SF fashion, this year hopes to top last year! What parties is Haboh looking to attend? Which artists are participating? It all starts tonight – because as our faithful listeners know, the weekend starts on Thursday night… with The So Very Show! Honoluluans might be wondering “what’s going on this weekend for us?” Well, don’t worry, there’s plenty to keep you on your toes, or shall we say, on the dancefloor? The Miss RIOT show at Hula’s – Keoki Inc. and Lucy Galore host the craziest un-pageant you’ve ever seen. It’s farewell to Keoki’s “RIOT” party! For details on these events and to stay updated, visit our Events Page. UPDATE: This week’s broadcast will begin one hour earlier, at 8pm Hawaii Standard Time. (11pm Pacific Standard Time, 2am Eastern Standard Time, 6am GMT) Synchronize your watches! Remember to visit 90hz.org to tune in! It was September 21st, 2006 that we were first introduced to Mr. Foolish Felix. Immediately, we hit it off. But our interests in common didn’t stop there. Felix frequents that Honolulu haven of disco (and house! ), thirtyninehotel, following in the footsteps (or should we say beats?) of his good friend DJ Harvey. But how could someone (a dj) sound “similar” to someone (DJ Harvey) who is so eclectic? Why, by bringing his own personal brand of eclecticism, one might even say Cynicism, into the mix. 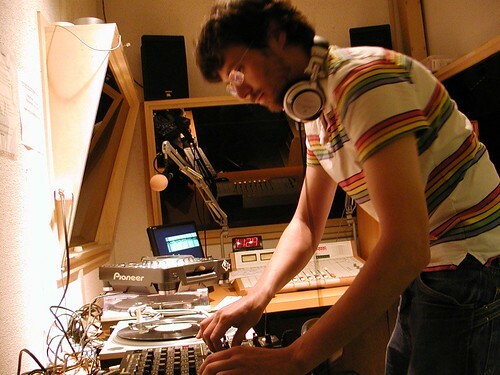 ‘Foolish’ Felix Dickinson has been DJing around the UK and the globe since the early 90′s- from long-term residencies in Brighton to gigs in Japan, California, Sweden, France, Greece and India. He has also released on Session, Discfunction, Wax Records, Ugly Music, Fools Gold and Big Bear under monikers Tacklehead, Foolish Fellas, L.H.A.S. Inc, Foolish and Shacra, and D.Bastedos. Felix will be the guest at Double Joy Disco at thirtyninehotel on Saturday, September 15th. This Thursday, September 13th, he’ll be our guest on The So Very Show where he’ll be doing an interview and a mix set and hopefully we’ll get to hear about his upcoming projects and releases! Until then, you can relax with some Foolish Felix mixes and a clip from my favorite Cynic Records cut “You Can Come and Get It” by Foolish and Sly. (If you just can’t get enough of it, you can hear the full track on the 9/21/06 podcast of The So Very Show, or you can visit Cynic Records to get the full length on vinyl or mp3. You are currently browsing the The So Very Show weblog archives for the News category.